I’ve gotta say I’ve wanted to try crockpot caramelized onions for a long time…and I finally have. I have mixed feelings about my crockpot, btw. What they do well, they do SO well and what they don’t do well…yikes! I have a few mixed feelings about the onions done in the crockpot, too. The final result was pretty darned good but there were a few that stuck to the sides of the pan and burned a bit, even though I stirred several times. You can’t just keep opening the lid over and over with a crockpot. Admittedly, they weren’t too bitter and since I wasn’t using my onions until the next day I tossed them in the fridge – as I reheated I noticed that they all kind of magically had evened out in color. You can see some darkness in the photos here & there, though. The other bothersome thing was the smell! Seriously, the onions I’ve caramelized stove top or in the oven didn’t smell like the ones in the crockpot do, and it didn’t go on for hours and hours, either! The biggest drawback is that it’s really hard to judge when the onions will be done – at least the first time. I’d recommend starting them before you go to bed on a day you’ll be around in the a.m. so you can keep a pretty close eye on them as they finish. All crockpots are a bit different, so you’ll want to figure out the timing for yours. Could be 8 hours or up to 12. Figure it out the first time (and if you’re like me, write it down) and it will be easier to get close to the mark for future batches. When I cooked these, I had no leftover onion juice by the time the onions were caramelized to my liking. This might vary by the crockpot and the onions. If it appears there is too much juice, lift the lid of the crockpot and allow to evaporate. On the plus side, it was so low maintenance I’d do it all again! Melt butter, toss olive oil, butter, salt and onions together. Add to crockpot and cook on low for 8 hours (or more) or on high for 6 hours (or more.) Stir two to three times during the process. Store in the fridge for several days or the freezer for several months. Note: Length of time depends on the crockpot and how deeply caramelized you wish the onions to be. Watch carefully during the final hours to prevent burning and to determine the timing for the next batch you make. This entry was posted in Click here for Fabulous Food Posts and tagged Caramelized Onion, Easy Recipe, Frugal Hausfrau, onions, Slow Cooker. Bookmark the permalink. I would never have thought to use a crockpot to caramelize onions! I will have to try this. Kyla, the first time i used my StepMom’s old round crockpot and I made them last week with my newer model. It needed a bit more babysitting at the end. Just thought I’d toss out that hint! How big are your crock pots? I can’t remember if mine is 8 quarts or 10, but it’s one of those really huge ones that you could cook a turkey in. I love caramelized onions! This is so good!! Nice idea.. Am thinking also letting the crockpot melt the onions and garlic and ginger for a curry base? Hi Mr. Fitz, I don’t see why not! I hope you’re going to post that curry base! I’d love to see it. I had never thought about caramelizing onions in a crock pot! I do mine in the oven, which is more hands off than on stovetop. I might have to give this new method a go sometime! I like the oven method, too, and is what I normally use, but this was nice. I’ll tell ya what, though, if I make these in the summer I’m going to put them on the deck!! I was just thinking about the story of my dog (he was a used dog) that his former owner told me. They let him out early Thanksgiving day and when they opened the deck door, he had someone’s ham! lol! 🙂 🙂 🙂 Yes, and I’m still waiting for him to bring my MY ham! lol! I love that you can do a whole mess of onions while you are doing them in the slow cooker. They do have a few drawbacks, but it is worth it! I’m going to have to check out that bolognese sauce. I really love the Bolognese – it’s winey and delish!! If all the wine is a drawback with the little ones, it could easily be cut back, too. I’ve never heard of doing this in a slow cooker Molly! They turned out perfectly. I think this would be pretty good for me as last time I tried to caramelize onions I never quite got there. I got too tired part way through (and I ended up with crispy-and-burnt onions instead…). I don’t have a slow cooker but I’ve made great caramelized onions in a dutch oven. And it lasts for ages in a jar in my fridge for addition to various dishes. Speaking of … I have some perogies (with caramelized onions and potatoes in the filling) in the freezer that are made even better pan fried in some butter/olive oil and caramelized onions and a spoonful of sour cream on top. When you’re only cooking for one, a batch is enough for 4 servings. I still have one left in the freezer. If I had sour cream in the house, I’d boil them up but I’m house bound (car is in for repairs). Tell me about it … I hope to get it back by Monday or I’ll have to get a rental on Sunday. What a great idea. I can’t imagine they would burn any more easily than when I do them on the stove top, so I’ll give it a try. You know, Hilda, that IS a really good point! we are just started learning the slow cooker – as you said, some things are good and some things are not. 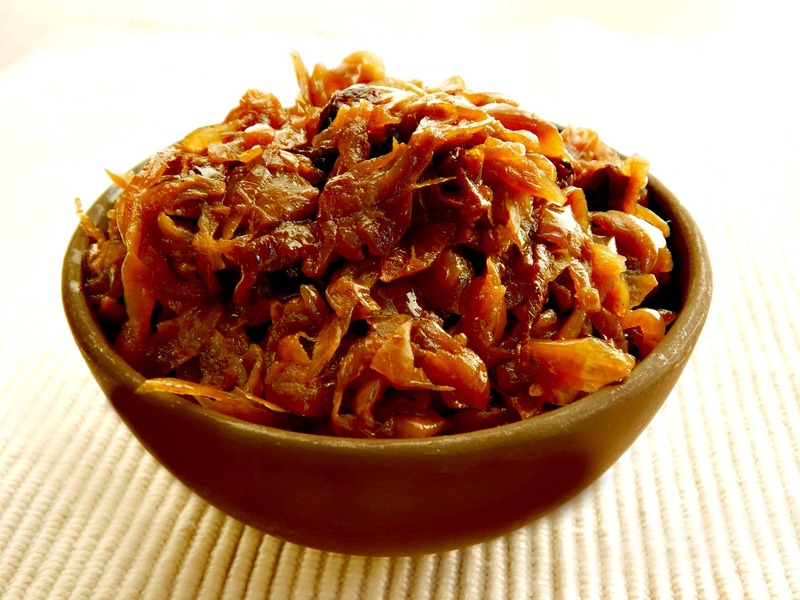 I like the idea of caramelized onions in the slow cooker – will have to try it! I hope you do – I’d love to hear what you think about them! By the way, I was somewhat emboldened after these onions and decided to make a crockpot dinner yesterday that we saw in a magazine! It was a glum dinner…we forced it down and I had to endure comments like “It’s not so bad, really…” lol! I might just stick to my pot roast, stew and bolognese sauce. Now that’s a great recipe!! You might really like it! Thanks, I will have to try that too!